Small and functional. Turn your old laptop LCD / LED display panel into a fully functional monitor. I received this panel controller quickly considering it was coming from Singapore to UK. The packaging was fantastic. Wrapped in a bubble wrap pouch and housed in a polystyrene box wrapped in tape, there was no way this item was going to be damaged. The boards were all connected and ready to go out of the box. At first I plugged the panel ribbon connector in the wrong way and could not get an image. Once I realised my mistake, everything worked perfectly. Luckily, I had a 12V 4A power brick handy so I could test this straight away. NOTE: This item is NOT shipped with a power cable. You must purchase a 12V 4A power supply to connect to the wall outlet. Please read the detailed description of the item before purchase. In terms of build quality, the solder points are solid and all the components are aligned and fixed in position. The output ports, power and audio output are all positioned along one side of the main board. Screw holes have been provided so attaching this board to a housing will be easy. No component protrudes above the output ports and with this low profile, the housing can be as thin as possible. The buttons on the panel controller board do not seem to be labelled correctly but they are all functioning and their function can be worked out by scrolling through the display menu. I suspect this is because this board is a custom build and has been programmed specifically for my panel model. Overall, this product does exactly what it is supposed to do and with an exceptional build quality at an affordable price, I can only recommend purchasing this product immediately if you are considering turning your old laptop panel into a fully functioning monitor. 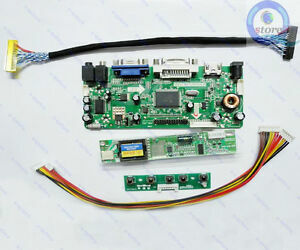 With this controller board an old laptop screen turns into a second monitor for my PC. Works great. Works for LVDS macbook pro 13"
Works as expected. Using it to connect a Macbook Pro 1278 mid-2009 display. Supports full HD 1920x1080p.